World class Hospital located in Bandra-Kurla Complex, Mumbai. Providing world class facilities and care with the best Cardiac Surgeons, Cardiologist & Medical Staff at a reasonable cost & Ethical Management to ensure best in patient care. Asian Heart Institute (AHI) has been set up by Contemporary Healthcare Pvt Ltd. with an aim to provide world-class cardiac care in India. It is situated at the Bandra-Kurla Complex (BKC), a mere 15-minute drive from the domestic and international airports, the hospital promises to provide quality cardiac care to patients at reasonable costs. At Asian Heart Institute full range of cardiology services are offered, from early disease detection to complex interventions. The diagnostic services include, ECG, stress testing, 2-dimensional echocardiography, stress echocardiography, holter testing, and angiography. The Cardiac Catheterization Laboratory, where angiographies, angioplasties etc. are performed, is a state-of-the-art, first fully digital panel Cathlab in the WORLD. The flat panel technology replaces the image intensifier technology, which has been in use for many years. Asian Heart Institute is one of the largest volume surgical centers in the country. The rates of complications (less than 0.5%) and mortality are comparable with the best cardiac centers in the world and are offered at very competitive rates. 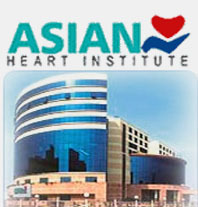 Asian Heart has the most advanced fully computerized state of the art Operation Theatres in the country. The largest Cardiac Theatre room in Asia is futuristic to allow technological innovation such as Robotic Surgery. The department of Laboratory Medicine is a round the clock facility with state of the art equipment. Biochemistry section has a fully automated, discrete, computerized Hitachi 902, random acres analyzer with a throughput of 200 Tests / hour. The laboratory has the facility to perform Arterial Blood Gas estimation with electrolyte estimation on stat basis with the IL 1610 and IL 1650 and ILYTE, ABG and electrolyte analyzer.The Blood Bank provides whole blood and various components like: Packed Cells, Saline Washed Packed Cells, Fresh Frozen Plasma, Platelet Concentrate, Cryoprecipitate, Cryo-poor Plasma. Platelet pharesis with donor screening is also carried out on the MCS+. The Blood Bank has a Component Preparation Laboratory with equipment like the Cryofuge 5500i from Heraeus. There is a deep freezer from Heraeus and platelet agitator and incubator from Terumo Penpol for storage of components. The department caters to out patients as well as in patients. Well-trained staff provide round the clock service.The instruments are interfaced with the Hospital Information Management System.